So many of us want to feel this way, every day, and tirelessly search to find proven methods that can guarantee us just that. Sound familiar? Well our friends James and Laurentine at Food Matters have a truly amazing event coming up! And I’m quite sure, you’re going to love it! 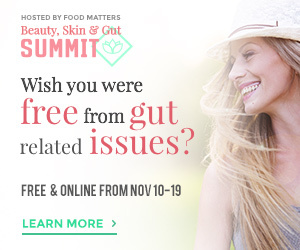 The Beauty Skin Gut Summit is a FREE online event from November 11 – 20 and will guide you on a 10-day personal journey to looking and feeling like a natural goddess! Laurentine and James are hosting the event, alongside some of the world’s leading health and beauty experts. If you haven’t heard of Food Matters and its founders James and Laurentine, then this is the perfect way to get introduced. They have built a truly mission-driven company and global movement, through their documentaries, online events, summits, and industry-leading health products. Each day during the Beauty Skin Gut Summit, you’ll get a free screening of a documentary, an expert interview, yoga or meditation class and healthy recipe videos! Plus you’ll receive a daily free gift too! The Beauty Skin Gut Summit will gently guide you into a life of more self love, radiance, and natural good looks! It’s been designed to have the perfect blend of cutting edge advice and powerfully practical solutions for transforming your life from the inside out! Make sure to secure your FREE spot now! This will be BIG and you don’t want to miss it. If you have any suggestion to improve the content please leave the comment.